Shaw did some new illustrations for this guest post I wrote for The Pitch's Fat City last Halloween. Enjoy...if you dare. Ronald McDonald is a friend to all children. Ronald McDonald with an ax? Not so much. Here are five Halloween costume ideas based on fast food mascots and how to make them. 5. 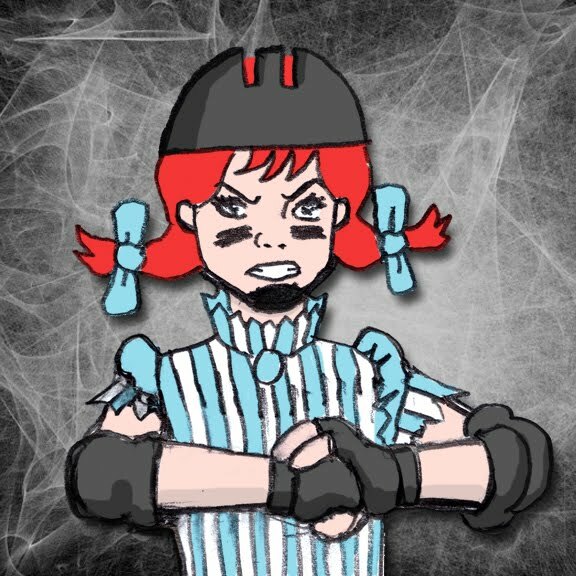 Wendy the Roller Warrior: Rebelling against the wishes of her father, Dave Thomas, Wendy is trading in old-fashioned hamburgers for a life on the track. Who knew she was such a badass? 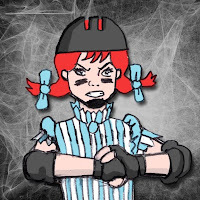 Dress like Wendy, and add elbow pads, knee pads, a helmet and roller skates. Or, to go a more traditional Halloween route, just be Slutty Wendy. 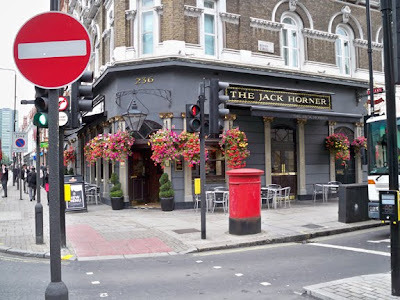 And since I was going, of course I’d have to make a point of checking out some of the native cuisine -- even though it’s frequently described as “lousy.” Before I left for my trip, I figured British food had probably just caught a bad rap. But then I saw “mushy peas” on a menu and I realized they’re not even trying to make their food sound good. If you’ve checked out our recipe for Cheesy Blasters, you know that we here at Lunch Blog are 30 Rock Superfans. As such, WGN America recently invited me to New York for a 30 Rock Superfans roundtable. While I was there, we filmed a bunch of spots and other stuff that'll be appearing in the next few weeks. The roundtable was all kinds of awesome. I got to hang out with 30 Rock writer Tracey Wigfield, plus a couple of my fellow Superfans, Nancy Alligood and Michael Wandling. 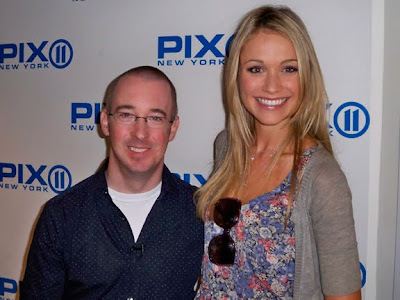 And as you can see above, I also got to meet Katrina Bowden, who plays Cerie on the show. Just look at that picture of the two of us -- she’s so into me, it’s embarrassing. More 30 Rock action is coming up here at Lunch Blog and on WGN America. Don’t you want to go to our Facebook pages and “like” them so you don’t miss any of the action? Plus, you can subscribe to the 30 Rock Superfans YouTube Channel and be notified when new videos debut -- including a cooking segment with me and Tracey making the Buffalo Chicken Shake. Here's a preview. In the meantime, take a look at some of Lunch Blog’s greatest hits over in the Popular Posts on the sidebar. I think we can all agree that Liz Lemon would be a big fan of Carny Surprise. Thanks for visiting Lunch Blog! Big thanks to WGN America and Story Worldwide for flying me out to New York. I sure am happy this whole thing didn’t turn out to be an elaborate organ-thieving scheme.